A Turkish court has accepted an indictment seeking 28-month-sentence against two opposition party members over their reactions to a minister during an election rally in Istanbul on March 17, Gazete Duvar reported on Friday. According to the report, three police officers, who were in charge of protecting the minister, had testified as witnesses during the prosecution. Two members of the opposition Felicity Party (SP), Ridvan Camlica and Yildiray Camlica, face up to 28 months in jail over a charge of “explicitly insulting a public official,” as they reacted to Turkey’s Interior Minister Suleyman Soylu for his terror accusations, targeting SP and its chairman, Temel Karamollaoglu. In an election rally in Istanbul’s Uskudar district on March 17, Soylu accused Karamollaoglu, along with Good Party (lYI) leader, Meral Aksener, of aligning with the pro-Kurdish Peoples’ Democratic Party (HDP). 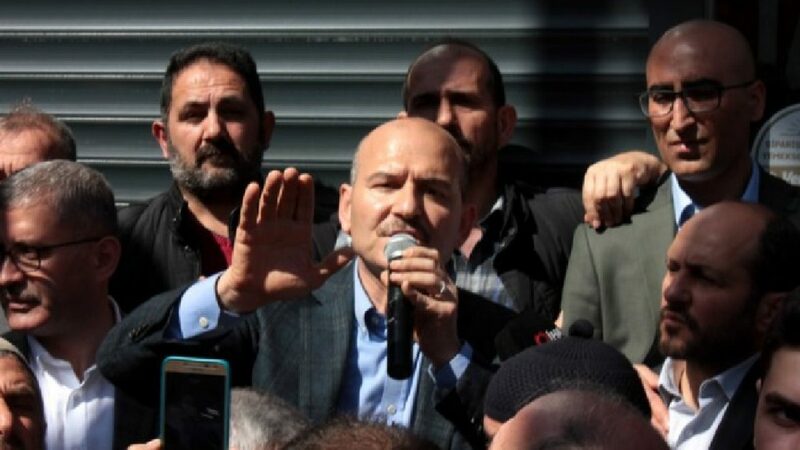 “If our government loses power after the local elections, our governors in Turkey’s east and southeast regions will not be able to walk freely in the streets,” Soylu claimed, aligning the opposition including SP with outlawed organizations such as Kurdistan Workers’ Party (PKK). “SP threw this country under the bus. Get out of here, you tactless! You’re shameless for going out in public,” Soylu yelled at Camlica and his nephew in response, pointing to SP’s cooperation with the Nation Alliance. It was formed by four opposition parties to rival pro-government People’s Alliance during general elections in June 2018 and local elections in March 2019. The Camlicas were detained by the police on a charge of insulting the minister and taken to Uskudar district police department for questioning. Both were later released by a court, under judicial control. The Anadolu Cumhuriyet Prosecutor Office has completed an investigation into the incident. In the prepared indictment, Camlicas are accused of insulting the minister with yelling. The indictment against Camlicas is solely based on the testimonies of three witnesses, who are police officers, working under Soylu’s administration. The Anadolu 38th Criminal Court of First Instance accepted the indictment seeking 28-month- jail sentence against the Camlicas over their reactions to the minister. Camlicas have denied the accusation of insulting Soylu. They said they would file a complaint against the minister for insulting SP.